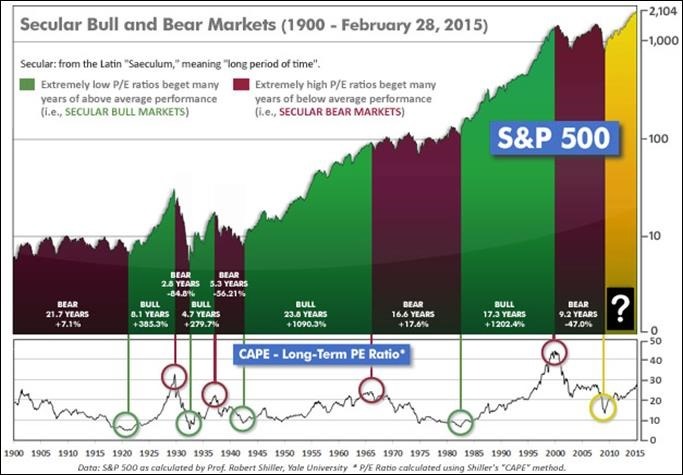 Even if we are in a new Secular Bull Market, market history says future returns are likely to be modest at best. The CAPE is at 27.8, up from the prior week’s 27.7, and approximately at the level reached at the pre-crash high in October, 2007. In fact, since 1881, the average annual returns for all ten year periods that began with a CAPE at this level have been just 3%/yr (see Fig. 2). The “big picture” is the months-to-years timeframe – the timeframe in which Cyclical Bulls and Bears operate. The US Bull-Bear Indicator (see Fig. 3) is at 59.4, up from the prior week’s 58.6, and continues in Cyclical Bull territory. The current Cyclical Bull has taken the US and some of Europe to new all-time highs, but many of the world’s markets have yet to top 2007’s levels – particularly in the Emerging Markets area. The intermediate (weeks to months) indicator (see Fig. 4) is Positive and ended the week at 36, up from the prior week’s 35. Separately, the quarter-by-quarter indicator – based on domestic and international stock trend status at the start of each quarter – gave a positive indication on the first day of January for the prospects for the first quarter of 2015. Most of the major market indexes established record highs on Friday, before falling back a bit to end the week mixed. On Friday, the Nasdaq was within 2.8% of its all-time intraday high established back in March 2000 before retreating slightly and ending the week up just +0.2%. The Dow ended the week at 18,132, down fractionally. The Transportation and Utilities Averages each lost about -1%. The S&P 500 closed at 2104.50 down -0.3% for the week. The S&P 400 midcap index lost -0.7%. The small cap Russell 2000 joined the Nasdaq in the plus column, gaining +0.1%. Developed International gained +0.1% for the week, helped by strong gains in the German market, where the DAX index vaulted +3.2% for the week to a new all-time high. The French CAC40 also gained, rising +2.5%. Strength in the Eurozone was attributed to improving economic numbers and the Greek bailout extension. Emerging Markets were relatively flat for the week ending up a modest +0.2%. Gold rebounded after 4 straight down weeks, closing at $1213.70 an ounce, up +0.9%. It’s more volatile cousin Silver gained +2.1% to close at $16.58 an ounce. Crude oil gave up more of its recent rebound ending -2.4% lower and giving up the important $50/barrel level, closing at $49.52. In US economic news this week, new-home sales rose at an annual rate of 481,000 in January, a +5.3% increase over last January and above forecasts. The median home sale price was $294,300, up +9% for the trailing 1-year period. Orders for durable goods rose +2.8% in January, beating expectations. Excluding transportation, orders still rose a modest +0.3%. The consumer price index (CPI) declined -0.7% in January, however this was attributed to the falling price of gasoline; excluding food and energy, the CPI rose +0.2%. The Chicago Fed’s National Activity Index rose to +0.13 in January, missing expectations of +0.15, but back in positive territory after declining to -0.07 in December. Also in the Windy City, the Chicago Purchasing Managers Index (PMI) sank into the sub-50 contraction territory in February, dipping to 45.8. The report included double-digit declines for production, employment, and new orders, and was the lowest number since 2009. US Q4 GDP growth was revised down to +2.2%, from the initial +2.6%, but it had been widely expected and caused no alarm. Consumer spending grew +4.2%, the fastest pace in 4 years, according to the Commerce Department. The S&P/Case-Shiller 20 city home price index rose +4.5% in December year-over-year, up from a +4.3% yearly rise in November. It was the first acceleration since November 2013 and perhaps the first indication that the slowdown in home price growth is ending. The Conference Board also announced that Consumer confidence fell harder than expected in February. The index was 96.4, while expectations were for 99.1. Jobless claims rose by 31,000 in the week February 21 to 313,000, whereas forecasts had called for 290,000. Continuing claims declined by 21,000 to 2.401 million. Federal Reserve Chairwoman Janet Yellen told the Senate Banking Committee that when policymakers lift their pledge to be “patient”, that it won’t raise interest rates for another meeting or two afterwards. The Fed “considers it unlikely” that rate hikes will come in either of its next two meetings, which are scheduled in March and April. Yellen gave 2 days of congressional testimony and was generally upbeat about the U.S. economy. She stressed that rate hikes won’t happen until Fed officials are “reasonably confident” that inflation is moving back toward the central bank’s 2% annual inflation target. Canadian CPI declined -0.2% in January, not as severe a drop as expected, and still up +1.0% versus year ago levels. In the Eurozone, deflation worsened in January. Year-on-year inflation declined to -0.6% in January, down from ‑0.2% in December. The yearly change was the worst since July ’09. Germany’s economy expanded +0.7% in Q4, in line with expectations. Year over year, German GDP grew +1.4%. German business confidence is on the rise: February’s survey was 0.1 better than January coming in at 106.8, the highest reading since last July. Retail sales in the United Kingdom sank in the Confederation of British Industry’s February survey to the lowest level since November 13. In France, consumer spending rose +0.2% in January while producer prices fell -0.9%. In China, Markit’s flash PMI for February rose +0.4 points to 50.1, a 4-month high but barely in expansion territory. The Manufacturing component rose +0.5 points to 50.8, a 5-month high, characterized by Markit as “marginal improvement”. Dr. Paulsen’s conclusion is rather than suggesting a bear market is imminent, the overvaluation mostly indicates vulnerability. While this condition remains, the market may simply struggle to make consistent gains. 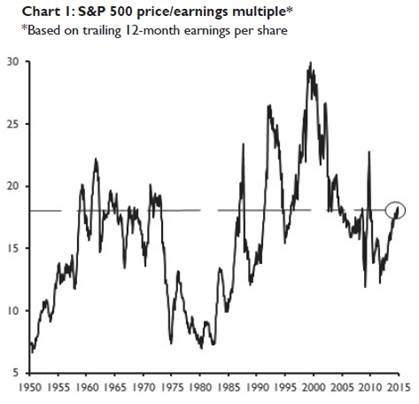 A “flattish” market with continuing earnings improvement may be enough to refresh median P/E valuations, concludes Dr. Paulsen. The average ranking of Defensive SHUT sectors rose slightly to 15 from the prior week’s 15.3, while the average ranking of Offensive DIME sectors rose to 12.8 from the prior week’s 13.5. The previous lead that Defensive sectors had over Offensive sectors has now reversed, and the Offensive sectors have slightly widened their lead. Institutional investors have rapidly exited the defensive Utilities sector in particular. Note: these are “ranks”, not “scores”, so smaller numbers are higher ranks and larger numbers are lower ranks. Be smart out there and watch the FACTS! How can I create guaranteed income that will last for life in retirement? How can you create guaranteed lifetime income? Seriously, who doesn’t want guaranteed income! 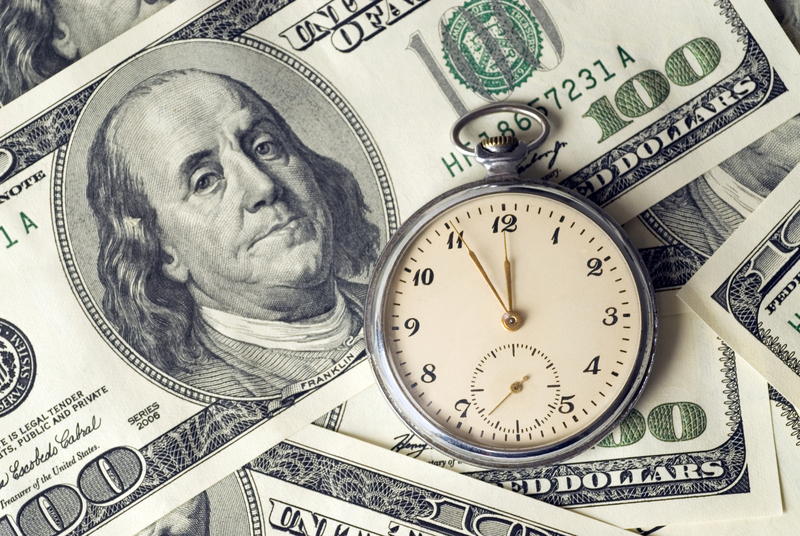 Eighty-four percent of adults polled in a new TIAA-CREF survey want a guaranteed income stream in retirement, and 46% are concerned that they will run out of money, yet only 14% have purchased an annuity to secure a steady stream of lifetime income. An annuity is not the only way to guaranteed income in your retirement, but it is one of the easiest. 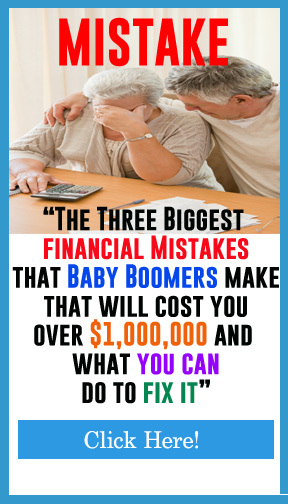 Let’s say that you’re a 65 year old male, and that you need an additional $1,000/month to get by, and you want that income to be guaranteed for your life. By purchasing a Single Premium Immediate Annuity (SPIA) for $179,000, you can get guaranteed payments for $1,000/month, which equals a 6.7% income cash flow. If you die next month, the insurance company would keep the difference, so you can add a cash refund option for $197,000 and your beneficiaries would get the difference lump sum. It drops the cash flow down to 6%, and is still pretty competitive. Instead of a SPIA, you could buy an indexed annuity for $110,000 at age 56, and structure it to start paying out at age 65 for $1,000/month as well. The benefit of going with the right indexed account is that this $1,000 can cover both you and your wife, and if either one of you were to need at home, assisted, or nursing home care, the $12,000/year income would double to $24,000/year until the money was gone. Once that happened, it would revert back to the original $1,000/month payment for life. Shop around, because prices, payouts, and special features vary by the insurance company. I like to go to http://www.Sidebysidequotes.com to get instant side by side price comparison options. If you want to look at your guaranteed income options, give me a call and I can run the numbers for you.